As every gym bunny will tell you, school holidays are a bit of a mixed blessing. While it’s lovely to forget the school run and spend some quality time with your kids, it also means less time to drop those squats and hold those planks. And if you combine school holidays with the annual choc fest that is Easter (although I’m pretty sure it’s not actually about the Easter Bunny…) well, it’s a recipe for disaster! So it was with a little less spring in my step than normal, that I set off to spend the Easter holidays in Amsterdam. Our self-catering apartment cancelled a week before we left, so we’d had to book into a hotel. I had visions of consuming nothing but pancakes and cheese for the next few days, with just light walking to keep me in shape (a chain is only as strong as its weakest link and this chain has a five year old in it). But I was wrong! After discovering that the tram was a bit on the pricey side, hubs and I decided to hire out bikes for the entire holiday and see the sights like the locals. So we headed off to MacBike rentals next to the central station and got ourselves sorted with some of the very last cycles available. 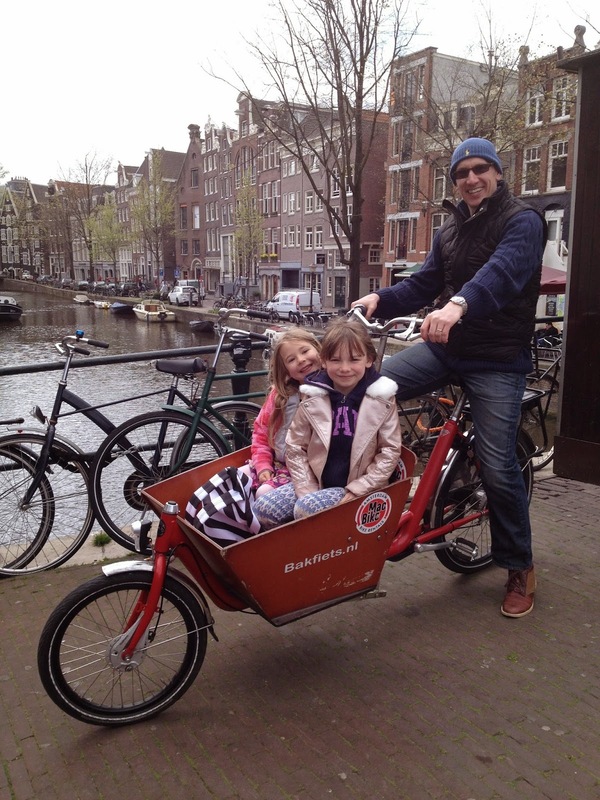 We got just the normal type for me – and a cargo bike (called a Bakfiets) for he, which basically has a big wooden box on the front suitable for luggage, shopping – or two over-excited children (or a combo of all of the above)! A box to put your kids in - perfect! I cannot tell you how easy it is to cycle around Amsterdam. I am not a proficient cyclist, and am not one to head off into traffic when I just have two wheels at my disposal, but the cycle paths and the general level of tolerance to those on bikes there is simply unbelievable. We’re talking wide two-way cycle paths, pretty much everywhere and cars, buses and trams that will wait forever for a hapless tourist not used to ‘that’ side of the road. This is why everyone here is so beautiful I thought to myself – because they all bike everywhere and obviously have done all their lives (plus they don’t wear helmets that mess up their hair…naughty). But turns out it isn’t just the outdoor cycling that the locals use to keep fit. Throughout the city there are several huge (and free) public parks (in fact there are officially 30 parks, but not all of them are huge!). 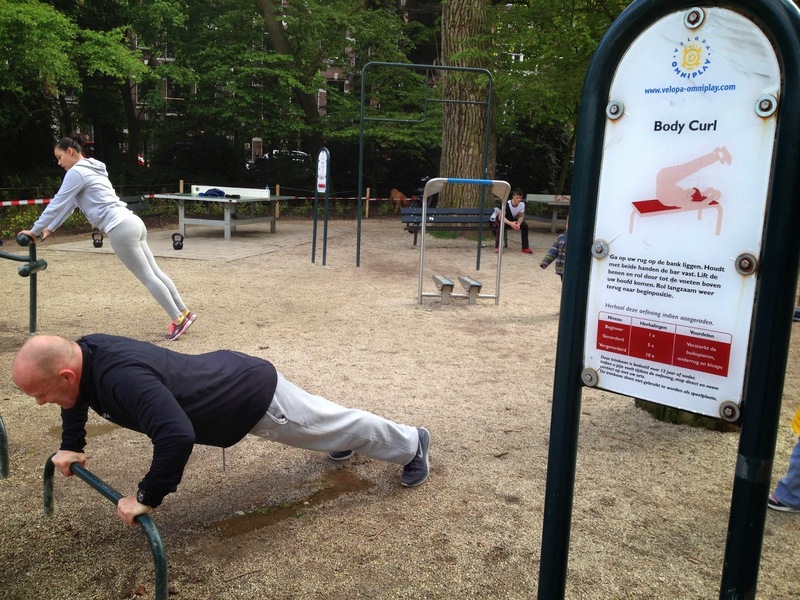 And the Dutch use them to the max, jogging around the perimeters and mixing it up with boot camps and tai chi classes. While I was there I saw people using park benches for step-ups, monkey bars in playgrounds for pull-ups and performing lunges here, there and everywhere. 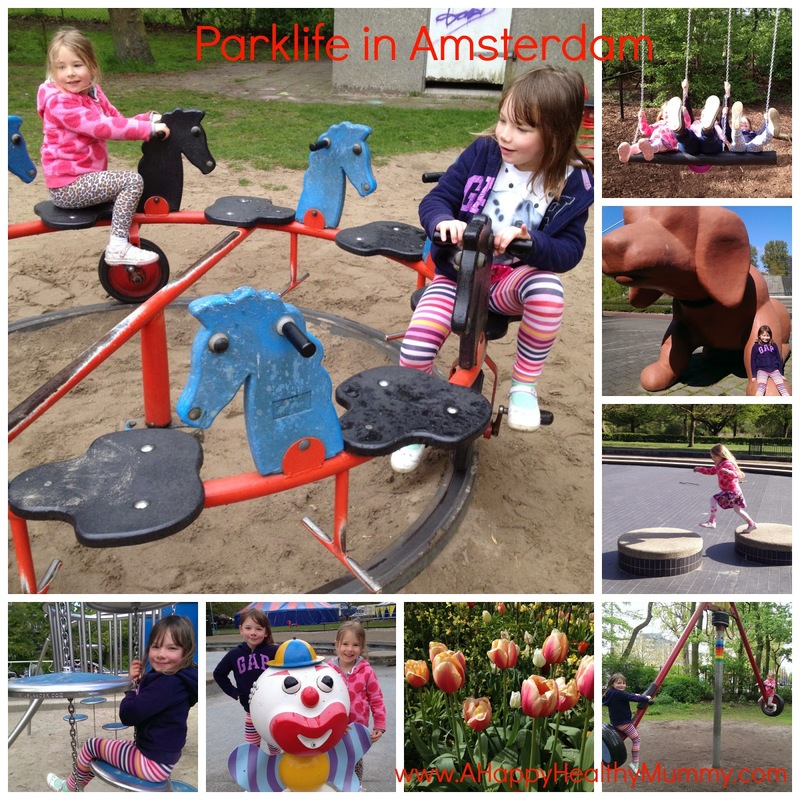 Sarphatipark Park in de Pijp district even has purpose built adult fitness equipment. I really wished I’d bought my trainers so I could join in! As an added bonus our kids loved visiting and playing in all the different parks as the adults spent all day cycling between them, drinking in the surroundings. So hats off to the Dutch for ingenuity, they have some lovely wide open spaces in Amsterdam city and certainly make the most of them. I came back from my break feeling great – I spent four days cycling and didn’t fall off once (personal record I think) and got to be outdoors for most of the day. It’s given me a taste for two wheels and motivation to try and find out more about working out when you don’t have the time or freedom to head off to the gym (like the they’ll-be-here-before-you-know-it summer holidays for example!). So how about you? Does this sound like your kind of break, or do you enjoy a holiday that lets you lie back and chill out? I’d love to hear how you stay fit and healthy when you can’t follow your usual routine. Comments below please. What a fabulous holiday! Yes, the Dutch basically live all their lives on a bike, so of course their cities are well adjusted to make cycling easier and more practical. Wish that was the same here in ol' Blighty. I bet your quads were lovely and firm afterwards. I certainly slept well!! It could never happen in the UK, the roads aren't even big enough for the amount of traffic we have - let alone adding a lovely wide cycle path everywhere. Still it would be nice if the drivers here could adopt the same attitude! Wow - love those boxes on the front of the bikes. How fun are they?!! More fun for the kids than my husband maybe? Still everyone likes a man with great thighs - right?! Was I one of those cyclists? I had to get used to being on the other side of the road...I'm pretty sure tourists there are the worst cyclists there! After a few hours though I got the merging thing straight in my head (like I say I'm not the best cyclist) - and definitely the kids in the basket meant we could get places so much faster (and less mummy stress than watching your child teetering around in traffic). I'd recommend Amsterdam - or even further afield in the Netherlands. I love Amsterdam! And cycling looks so much fun. We went to France 'camping' this weekend but were hit by fevers and not being well. Sigh! Lovely photos. A girl after my own heart! I can't do lying on a beach, I burn for one! I cycled Holland years ago s a teen and loved it and have done many family cycle trips here with bikes on the camel trail. I love the bucket you have there for the kids, so much more fun for a way to sightsee. Thank you for popping over and joining me for Country Kids, I hope you can come back again. Hello, yes I burn too - let alone all the sitting about on sun loungers! We go to Polzeath every year - maybe we should do the Camel Trail this year - although the boogie boarding is our main focus (and I quite fancy getting myself some surf lessons). Arh I used to live in Leiden and travelled to Amsterdam regularly! the parks in Holland are soooo nice. I do miss it! most of all I miss my bike, I named her Neive! Anyway, yes this sounds like my kind of break! although I do like to relax at times too! can I have abit of both please? :) so glad I found your blog via the #allaboutyou linky! Thanks for commenting. It did make me wonder if the parks in London are as well used - it's such a long time since I lived there and I certainly wasn't worried about kids or looking after my health then!! I loved the customisation some locals had done to their bikes - there was a bit of a trend for fake flowers going on when I was there! You've inspired me with all that cycling around Amsterdam. Sounds like a really fun holiday. Definitely on our possibility list for future mini-breaks with the kids. I do love a city break with the kids - big cities just seem to have so much on offer, it helps when the weather is clear though. As the children get older I hope we can all bit a bit more active when we go on holiday, I'm not into lying on my back (!) in the sun at all. I want the kids to see more than a holiday club! Keeping fit like that on holiday means i can sample more of the local fare... Win Win! Mmm, I like your way of thinking! I know! There's that saying 'we don't don't stop playing because we get old, we get old because we stop playing' - I try to think like that! 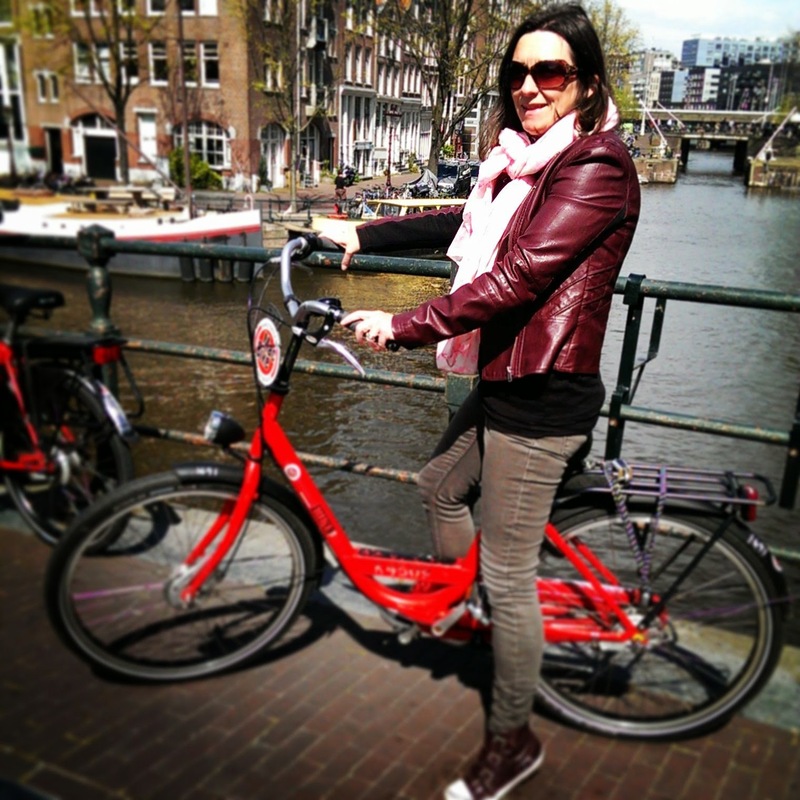 I love Amsterdam and love biking around it when I visit! It helps offset all the fries and mayonnaise I inevitably eat!! Ooo, I missed that opportunity! Must.Try.Harder! Still it's likely we'll go to The Netherlands again as I was so impressed by it. I love the combination of activity, exploring and chilling out. Having said this, I yearn for beach holidays and just laze when it's really hot, but city breaks are all about active discovery for us! Thanks for linking to #AllAboutYou - would be fab if you could add our little badge to your post and do come by again on Tuesdays!! Hello - do your children actually laze about though? I don't think mine are capable, so I have a few more years until I can thinking of combining activity, exploring and chilling out! And yes, the template I'm using doesn't show badges, I need to sort that out! Oh, I might add Bruges onto our list of cities to visit en famille then! While mine will run about and play for hours in a park, getting them to walk about 'sightseeing' would end in tears (the grown-ups probably). Thanks for commenting.